for the historically groundbreaking and most charming, beautiful, intelligent explanation of the mysterious High Reality Machine (HRM_1.0n). for insights linking the High Reality Machine to the early works of Albert Einstein in a transdisciplinary way. Deadline Extended to June 15, 2005! In 2004 the MARS PATENTs founders Claudia Reiche and Helene von Oldenburg agreed to underwrite a contest designed to prove that MARS PATENTs HRM_1.0n, the High Reality Machine works and to explain its principle functions. The authors pledged a Grand Prize of two polished brass plates for the first scientist or artist whose solution is convincing to the MARS PATENTs Grand Jury. This Jury consists of 5 (five) randomly chosen members of the Friends of the MARS PATENT with an international reputation and experiences as jury or progamm committee members, chairs of institutions or else. This jury will stay anonymous until the results of the reviewing process being declared to guarantee their independency. One brass plate with the engraved name of the winner will be teleported by the HRM_1.0n to the Mars Exhibition site (MES), and fixed with 2 brass screws on a beautiful rock on Mars, coordinates: Latitude 19° N, Longitude 281° E, facing south. 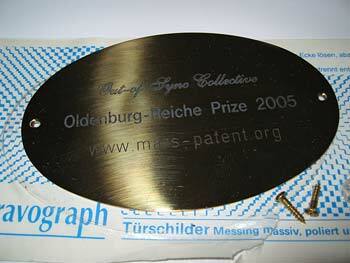 The second brass plate will be given to the winner at her or his free disposition. If there are two equally convincing submissions, the female author will be declared winner. Submissions should be e-mailed to: office@mars-patent.org until May 31, 2005, 24:00. The winner will be notified as soon as possible and presented on the MARS PATENTs website, as will every submission to allow a public discussion of the submissions and the jurys choice.